It’s offi­cial: John Deere and Gen­er­al Motors want to evis­cer­ate the notion of own­er­ship. Sure, we pay for their vehi­cles. But we don’t own them. Not accord­ing to their cor­po­rate lawyers, any­way. Prop­er­ty rights are the cor­ner­stone of a free soci­ety. 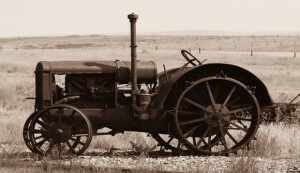 They were already under attack long before John Deere start­ed com­put­er­iz­ing farm trac­tors. Usu­al­ly the attack­ers are from some lev­el of gov­ern­ment, but large cor­po­ra­tions are join­ing the fun. Yet the cor­po­rate attacks typ­i­cal­ly use polit­i­cal­ly cre­at­ed weapons. John Deere relies on the 1998 Dig­i­tal Mil­len­ni­um Copy­right Act to claim that the farm­ers who “buy” its trac­tors pos­sess only the phys­i­cal machin­ery, not the soft­ware that makes it run. Not coin­ci­den­tal­ly, nor­mal main­te­nance is almost impos­si­ble with­out access to this soft­ware. This effec­tive­ly forces farm­ers to keep pay­ing John Deere for the trac­tor long after they sup­pos­ed­ly gained own­er­ship of it. Some farm­ers try to avoid this extor­tion by hack­ing their own trac­tors. John Deere claims this is ille­gal under the DMCA law and is ask­ing the Copy­right Office to stop it. Gen­er­al Motors is par­tic­u­lar­ly pas­sion­ate about its “intel­lec­tu­al prop­er­ty” claims. Wired writer Kyle Wiens dis­miss­es their argu­ments. GM went so far as to argue lock­ing peo­ple out helps inno­va­tion. That’s like say­ing lock­ing up books will inspire kids to be inno­v­a­tive writ­ers, because they won’t be tempt­ed to copy pas­sages from a Hem­ing­way nov­el. Mean­while, out­side of Bizarroland, actu­al tech­nol­o­gy experts—including the Elec­tron­ic Fron­tier Foundation—have con­sis­tent­ly labeled the DMCA an inno­va­tion killer. They insist that, rather than stop­ping con­tent pirates, lan­guage in the DMCA has been used to sti­fle com­pe­ti­tion and expand cor­po­rate con­trol over the life (and after­life) of prod­ucts. Bin­go. If you want to pro­mote inno­va­tion, you allow peo­ple with dif­fer­ent ideas to try them. That’s how reg­u­lar cars grew into souped-up drag­sters. Own­ers tin­kered, mod­i­fied and cre­at­ed some­thing new and dif­fer­ent. GM and John Deere now seek to make this kind of inno­va­tion impos­si­ble. Their real goal is to elim­i­nate com­pe­ti­tion, and they are using polit­i­cal pow­er to do it. They may suc­ceed, too – for now. This kind of behav­ior incen­tivizes inno­v­a­tive peo­ple to find dif­fer­ent plat­forms. A few rebel farm­ers are right now ask­ing them­selves why they need John Deere or any oth­er kind of trac­tor at all. Break­throughs in LED light­ing tech­nol­o­gy com­bined with renew­able ener­gy are mak­ing large-scale indoor farm­ing more cost-effec­tive for some crops. By using copy­right laws to make its trac­tors more expen­sive and less use­ful, John Deere may be plant­i­ng the seeds of its own destruc­tion. Stop­ping a few hack­ers is easy. Stop­ping human inno­va­tion is impos­si­ble. Those who try it always get what they deserve.